The very first This Is Your Trial show in Edinburgh was for Hearts FC. 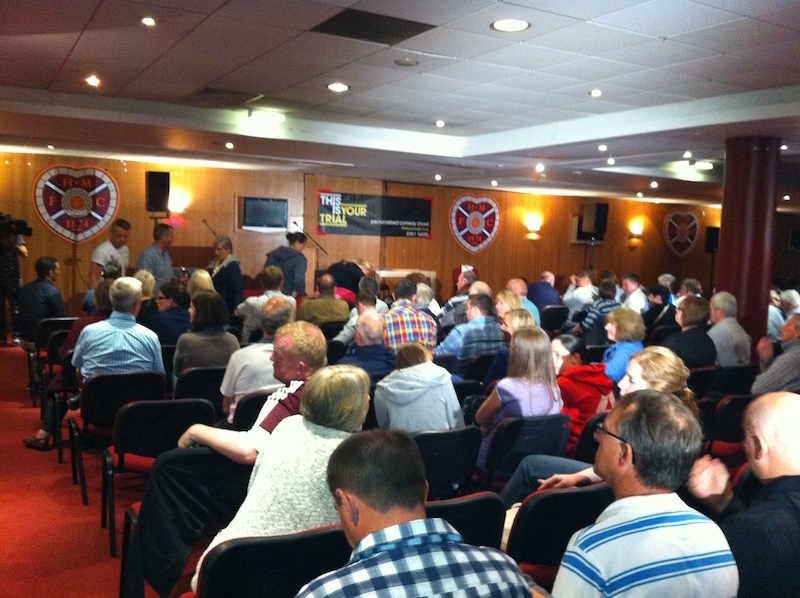 It took place at Tynecastle Stadium and was attended by 200 ‘Jambos’. The first team manager at the time was Gary Locke and he put himself forward to be the ‘accused’. The purpose of the trial was to raise money for the club which was in administration. Work with the communications manager, Paul Kiddie, we devised a show that would bring some fun to the club during a very dark period. Norman Lovett was the judge, with Bob Slayer and Janey Godley as QCs. Jenny Beake came along to perform a song at the end of the show. A film crew from SkySports came to record a news item ahead of the Edinburgh derby. The Scotsman newspaper wrote a feature article about the show. Hearts boss Gary Locke became a comedy star for a night in Fringe show This is Your Trial, in a bid to raise cash for the troubled club. The Jambos manager was the defendant in a mock trial written by football-daft comedy producer David Allison. Tynecastle’s Gorgie Suite became a courtroom for the night as QC Norman Lovett – best known as Red Dwarf’s Holly – presided over the case. Acting for the prosecution was funnywoman Janey Godley, while representing Locke – who wore a white T-shirt bearing the word “guilty” throughout the trial – was comedian Bob Slayer. And no courtroom drama would be complete without its star witnesses – former manager Jim Jefferies and former Hearts striker Scott Crabbe. Also taking the stand was Gary’s long-suffering “hairdresser” – who dubbed the manager “Luscious Locks” – and the voice of Hearts, Tynecastle stadium announcer Scott Wilson, who described him as a club legend who had risen to the pinnacle and was “living the dream”. Locke was every bit the good sport as he laughed off quips about repeat employer Jefferies, his abysmal 1998 curtains-style haircut and the decision to mow the club crest into the pitch without checking if it was allowed. A capacity crowd attended the show, aimed at raising money for the cash-strapped club. The evening’s entertainment ended with a ditty inspired by Locke, performed by comedienne Jenny Beake, and – of course – a rendition of club songs. The show will be staged another five times during the Fringe at Bob’s Bookshop until Friday, with other names in the dock. Comedy critic Kate Copstick has agreed to stand as one of the accused whilst two other shows will feature the staff of companies such as underwear ﬁrm Bawbags and Scottish Borders Brewery.